Breast milk is full of nutrition and healthy substances to help your baby grow, develop, and fight off illness. It's the ideal food for your child. But, you may be wondering if breast milk contains everything that your child needs and whether or not your breastfed baby should take vitamins. Here’s what you need to know about vitamin and mineral supplements for breastfed babies. While most of your child’s nutrients come from your breast milk, there are a few vitamins and minerals that healthy breastfed newborns may not get enough of through breastfeeding alone. The following are the typical vitamin and mineral supplements that breastfed babies receive. There is only a small amount of vitamin K in breast milk, and all babies have low levels of vitamin K when they're born. Babies need vitamin K to clot the blood and control bleeding. So, every child, whether breastfed or not, is given a shot of vitamin K immediately after birth. This injection helps your baby’s blood to clot and prevents a rare, but dangerous, newborn bleeding disorder. After the initial newborn dose of vitamin K, a healthy child will not need any additional vitamin K supplements. Your child uses vitamin D to absorb calcium and build strong bones and teeth. It also plays a role in the immune system, so it may help prevent infections. Without enough vitamin D, a child can develop a condition called rickets. Rickets can lead to the softening of the bones and problems with bone development in children. It can also cause slow growth, pain, and bone deformities such as bow legs. While it’s rare, a breastfed baby can develop rickets if there’s not enough vitamin D in the breast milk. Breast milk does contain vitamin D, but the amount of vitamin D in breast milk is different from one woman to the next. Your main source of vitamin D is the sun. When you expose your skin to the sun, it makes vitamin D. But, the amount of vitamin D you get from the sun depends on your skin color, the amount of time you spend in sunlight, and your use of sunblock. Women with darker skin tones have to spend more time in the sun than women with lighter skin tones to get the same amount of vitamin D. Of course, with the use of sunblock, women with all skin tones end up blocking their exposure to the sun and preventing vitamin D production. These factors affect how much vitamin D is in your body, which then affects how much vitamin D is in your breast milk. Your baby can also get vitamin D from the sun. However, it’s not recommended to put young infants directly in the sun. When they do spend time outdoors, infants and young children should stay covered and wear sunscreen. Again, this protection from the sun prevents the production of vitamin D.
Since many women and infants do not get enough vitamin D from the sun, there is the risk of a vitamin D deficiency in children who are breastfeeding exclusively and those whose feeding method is a combination of breastfeeding and formula feeding. More time in the sun would help, but overexposure to the sun has its own risks, such as the development of skin cancer. Supplementing moms isn’t the answer, either, since studies show that supplementing a mother with vitamin D doesn't make a big difference in the amount of vitamin D in the breast milk. So, to prevent a vitamin D deficiency and bone problems, the American Academy of Pediatrics (AAP) recommends a supplement for all breastfed babies. Vitamin D is given in liquid drops, and the recommended dose is 400 IU a day beginning the first day of life. Babies who are exclusively formula-fed with an infant formula that contains vitamin D (at least 400 IU/L) do not need any additional vitamin D.
Iron is an essential mineral for your baby's growth and development. It’s needed to make the red blood cells that carry oxygen throughout the body. If your little one doesn’t get enough iron, it can lead to anemia. Iron deficiency anemia may not have any symptoms, or it may cause pale skin, a fast heartbeat, feeding difficulty, and weakness. Long-term iron deficiency can lead to problems with the development of the body and the brain. There is iron in breast milk. It may only be a small amount, but it’s enough for your child because babies absorb the iron in breast milk very well. In fact, they absorb the iron in breast milk much better than they absorb the iron in infant formula. Babies also store iron in their bodies toward the end of pregnancy. So, between the stored iron and breastfeeding, a healthy full-term baby will have enough iron for the first 4 to 6 months of life. If you're breastfeeding exclusively, your child should not need an iron supplement for up to 6 months after birth. But, by 6 months of age, babies use up what's in their body, and the iron in breast milk will no longer be enough. According to the AAP, after four months of exclusive breastfeeding, there is a greater risk of iron deficiency. So, between four and six months, your baby's pediatrician will recommend the addition of an iron supplement for your child. Iron is given as a liquid in a dose of 1mg/kg/day until your child is getting enough iron through her diet. At 1 year old, the doctor will test your child for iron deficiency and let you know if you need to continue iron supplements. If your child breastfeeds and drinks infant formula, he will need supplementation if you breastfeed or give breast milk more than half of the time. The supplement for partially breastfed infants is the same as for exclusively breastfed infants. Children who receive infant formula do not need an extra iron supplement if they’re using an iron-fortified infant formula. Your drinking water doesn’t contain enough fluoride: In many places, fluoride is added to the local drinking water supply. If you use the public water supply in your home and it contains fluoride in an amount less than 0.3 parts per million your child may need a supplement. You can call your water company to get information on the fluoridation of your water. You use well water: If you have well water at home, test it for fluoride. Water usually contains some natural fluoride, but it may not be enough. You use bottled water: If your child uses bottled water, it may not have enough fluoride for your child. However, some brands add fluoride, so check the label on your brand of water. It’s important to know how much fluoride is in your water supply so your child’s doctor can make the right decision about fluoride for your baby. While your child needs fluoride for healthy teeth, too much fluoride isn’t good. It can cause other problems with tooth development and staining of the teeth. Preemies: A baby born early has different needs than a baby born at full-term. Premature infants don't have the same iron stores as full-term infants, and they may need more vitamins and minerals than breast milk or formula can provide. The types and amounts of supplements a preemie needs depend on how early the child is born and her health condition. Children born with special health concerns: Children born with health issues may need iron or other vitamins and minerals right from the start. Each child’s unique challenges will determine which supplements are needed. Babies of moms who are vegan: Meat and dairy products are the main sources of vitamin B12. So, if you follow a strict vegan diet, your breast milk may not have enough of this vitamin. It may be enough for you to take B12 supplements during pregnancy and lactation. However, your baby may also need a supplement if your B12 levels are too low. Babies of mothers who've had weight loss surgery: If you’ve had a gastric bypass you can still breastfeed. Just be sure to tell your doctor and your child’s doctor about your surgery. The health care team will monitor both you and your child. You will have to take additional vitamins and supplements, and your child may need them as well. 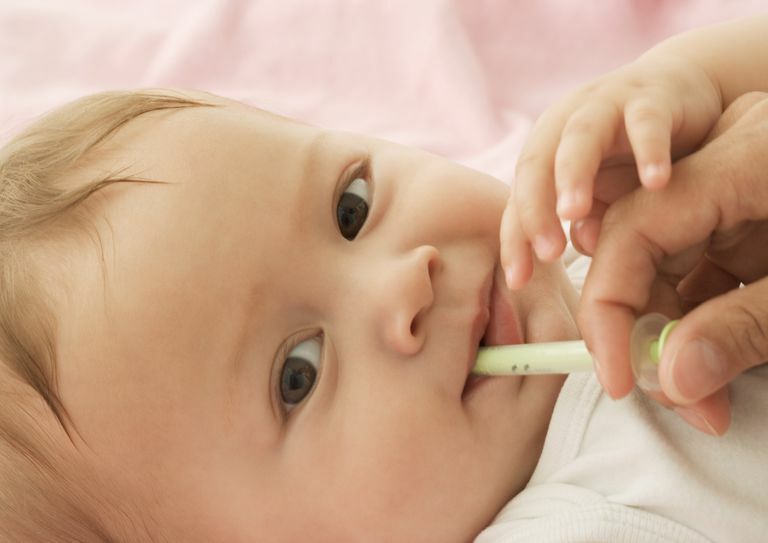 Breast milk does contain everything your baby needs, including vitamins and minerals. However, there are just a few things that children may need more of to ensure that that they grow and develop in a healthy way. Vitamin supplements don't cause harm when they are given as directed, but it could be a problem if a baby develops a vitamin or mineral deficiency. Supplementation is an easy way to make sure each child gets what he needs. So, if you’re breastfeeding a healthy full-term newborn, your baby should start a vitamin D supplement right away. After four to six months, your child may need additional iron, then after six months, depending on your water supply, a fluoride supplement may be recommended as well. See your baby’s doctor regularly for well-baby visits to stay informed, get your questions answered, and keep up-to-date on what your child needs. Baker RD, Greer FR. Diagnosis and prevention of iron deficiency and iron-deficiency anemia in infants and young children (0–3 years of age). Pediatrics. 2010 Nov 1;126(5):1040-50. Clark MB, Slayton RL. Fluoride use in caries prevention in the primary care setting. Pediatrics. 2014 Sep 1;134(3):626-33. Kleinman RE. Introduction: Recommended Iron Levels for Nutritional Formulas for Infants. The Journal of pediatrics. 2015 Jan 10;167(4): S1-2.